Following a series of immaturity issues through Sanctuaire’s younger years, Mornington-based trainer Tony Noonan looks to have ironed them out of his promising mare who broke through for her maiden win at Seymour this afternoon over 1100m. Although it was only career start number 7 for the 4-year-old mare by Animal Kingdom, Noonan and rider Jake Noonan were relieved to finally have Sanctuaire’s career back on track. “She’s furnished and probably matured more as a horse,” said Jake after the win. “She just raced a little bit keen in the middle stages. Jumping from barrier 8 in the field of 9 on the Soft 5 going, a lack of early speed in the race enabled Jake to settle forward in the run, taking a comfortable sit behind the leaders. 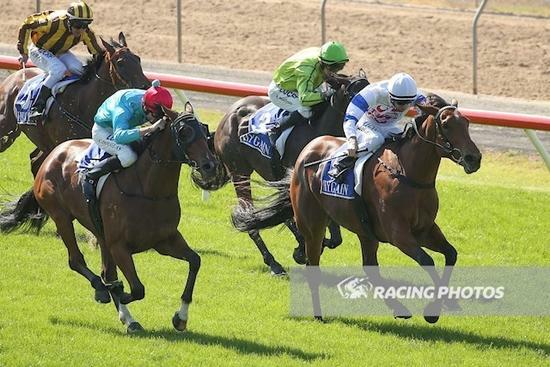 Tracking into the race upon straightening, Jake eased his mount towards the centre of the track where Sanctuaire ($3.20) ambled up the leaders before kicking clear to hold on from a fast-finishing Dataset ($9) by a head. Sanctuaire carries the colours of long-time stable client Jammie Dillon. For those familiar with Sanctuaire and her stablename “Daenerys”, today’s victory may have been foreseen by those who backed her from $7 into $3.20 on the same day her namesake made her long-awaited seasonal return in Game of Thrones.